Where crowds gather, Balloon Ads will float above them all. From distances near and far oversized balloons with carry your boldly printed message for all to see. 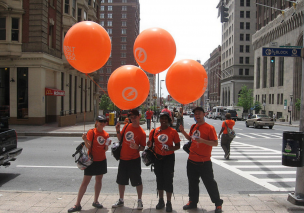 Ad Balloons are custom printed and measure 48” inches in diameter. For an evening experience, light up your balloons and let the illuminated globes light up the evening air with your advertisement. High Impact - Brand ambassadors wearing color-coordinated uniforms will fan out and circulate throughout the crowds, keeping this advertising campaign on the go and maximizing your visibility. Brand ambassadors can also pass out booth traffic coupons or company information.